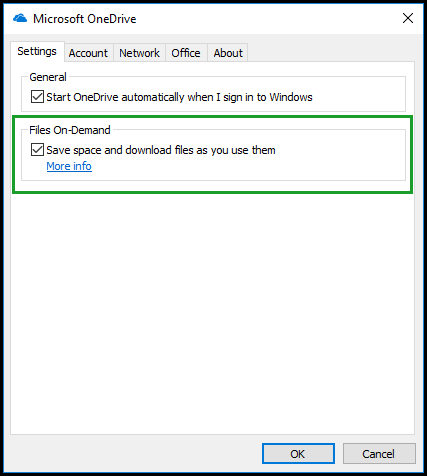 Files on Demand is a OneDrive Sync technology that greatly improves the efficiency of cloud synchronisation. Microsoft’s SharePoint and OneDrive both allow cloud files to be sync’d locally to your PC. Note: It’s generally better to leave your files in the cloud and work on them there and only sync things you need rather than sync the whole lot to your device but things get easier to manage and you save a lot of disk space while reducing the impact on your internet connection when you have Files on Demand enabled for those times where you have sync things locally. You have to be running the Windows 10 Fall Creators Update (version 16299.15 or later) and you have to have the latest OneDrive for Business Client installed. Most Windows 10 computers with Updates enabled should easily meet these and if you don’t have updates enabled then we recommend you enable Windows Updates and get secure, without updates you are exposed to many threats and are missing out on the best features of the best Windows ever.